Head to Resources > Availability to see how much stock you have across your stores. 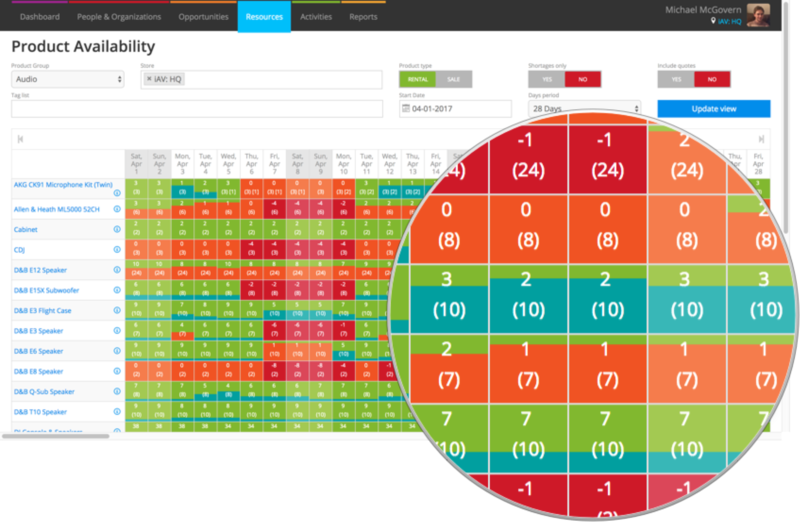 Get a high-level overview of availability across your company with the Product Availability screen. View all of your products, or filter by product group and/or tags. Choose which store’s availability you’d like to see, or see stock across all of your stores. Set how many days you’d like to see in the view – from a single day up to 28 days. Toggle to show just shortages or to include “quoted for” figures. To get to the product availability screen, go to Resources > Availability. Your initial view is blank. Choose some filters at the top to get started. Choose one of your product groups to see availability for a particular product group only. Filter by product tag – great for drilling down to a subset of products. When you first visit, this will be set to the store you’re in right now. Add additional stores here if you like. When do you want to see availability from? How long do you want to see availability for? Get an hour-by-hour breakdown on 1 day, all the way up to a full 28 days ahead. Toggle to YES to see products with shortages in your chosen period. Toggle to YES to include “quoted for” quantities in your view. You don’t need to choose any filters – just hit Update view to see all of your products. You’ll get a view with your products on the left and time periods (days, hours, etc.) along the top. Each tile represents a period of availability, typically one day. Each tile is color-coded so you can see what’s available at-a-glance. Green is available – you have sufficient stock for any orders or reserved quotations. Orange means you’ve booked all your stock or you’ve hit the buffer percentage set against the product. Red tiles indicate overbookings – you don’t have sufficient stock to fulfill your orders or reserved quotations. As your stock is rented or quarantined, a blue bar on each tile appears and grows, a bit like water in a tank or a bar chart. The numbers on each tile tell you exactly how many you have available, as well as how many you hold, and how many are sub-rented. Want to see why a particular product is overbooked? To get more detail, click on the product name on the left hand side to access the product bookings screen. Use this screen to see all orders and open, provisional, and reserved quotations for this opportunities. Change the “Product type” slider to SALE to see an inventory for your sale stock. Free stock – overall availability based on the other three columns. When do the items added to an opportunity become available? When you mark a quotation as reserved or convert to an order, items are reserved and your availability is adjusted. Check out our guide for more information, see: How do the stages of an opportunity impact availability? Can I prevent my system from letting me overbook?